A brand-new floor can do wonders to improve the look and feel of your home. They also help you drastically increase the value of your property – as long as they continue to look good. So what should you do if you are concerned that water and moisture will damage your new floors? You should reach out to our professionals and discover our beautiful waterproof flooring in San Marcos, CA. Waterproof flooring installation allows you to protect your favorite type of flooring from the two biggest threats to its appearance and performance: water and moisture. Our flooring company delivers the attractive selections you want for your home, including waterproof vinyl flooring, waterproof laminate flooring, and even waterproof carpet. These options are available for any room of your home and excel when it comes to protecting your kitchens, bathrooms, and outdoor areas. Are you concerned about spills or moisture in a specific room? Then you should consider reaching out to us to learn more about our waterproof vinyl flooring, laminate, or carpeting. Using advanced manufacturing techniques, these floors are designed for active living and moisture-prone environments. That means they are going to stand up to the test of your day-to-day life. You have design ideas for your home: a style that you want to see come to life through fixtures and, especially, your flooring and other surfaces. Don’t let worrying about water damage scare you away from bringing your vision to life. Instead, purchase attractive waterproof vinyl flooring, laminate flooring, or carpeting from us. We offer waterproof flooring that is ideal for any of the rooms in your home where spills or moisture are most likely to develop, including kitchens, bathrooms, basements, cafeterias, mudrooms, and any other room that gets wet. All of the products we sell are manufactured using high-grade materials that are capable of holding up even in the wettest of environments. Visit our store for assistance if you are in need of waterproof flooring that is durable as well as appealing. One of our very friendly, knowledgeable, and experienced associates will gladly help you choose a product that suits your current design needs. Add unique ambiance to your kitchen or bathroom with waterproof laminate flooring. Your kitchen and bathroom areas are some of the most used rooms in your entire home, which means you want to make sure they look their best aesthetically. These two rooms, however, are also two of the biggest water-prone areas in your home. So while many property owners love the value-added appearance of hardwood or natural stone flooring, they cannot add these types of floors to their kitchen or bathroom without the potential of having their new floors succumb to major wear and tear. Even though natural stone is not susceptible to water damage, it can be hard underfoot. For a softer, beautiful, and durable choice for your kitchen and bathrooms, consider installing our COREtec and Downs H20 waterproof vinyl or laminate floors. Because the flooring options we offer have waterproof cores, they do not degrade, rot, or expand when they are exposed to moisture. They are also capable of preventing liquid from soaking into the subfloor. The best part? They are easy to maintain to ensure that your floor continues to look great through years of usage. Simply sweep and mop your new floor when it is dirty and it will look like new again. The waterproof flooring we offer also holds up well under heavy foot traffic, which makes them ideal for busy households. Contact our professional waterproof flooring installation team today so you can start enjoying your new floors in no time. Can I Get Waterproof Carpet in My Home? Yes. You can have carpet that is waterproof! Protect it from spills, pet accidents, and moisture by letting us install it for you. Not only are these carpets stain resistant, but they also do not suffer from water damage. In fact, they are capable of preventing water from penetrating the floor beneath. Instead of worrying about your carpet, let us ease your carpet concerns. 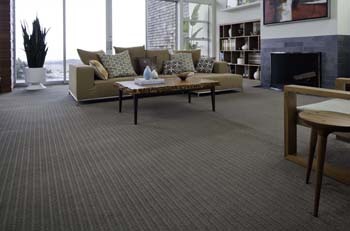 Our state-of-the-art products offer a level of protection that ordinary carpets cannot. Contact us for more information about our waterproof flooring installation services. We proudly serve customers in throughout San Marcos, Carlsbad, Escondido, and Oceanside, California.